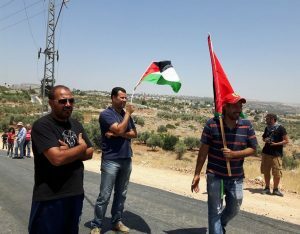 On friday, many Palestinians from Bil’in village, west of the central West Bank district of Ramallah, held the weekly nonviolent protest, accompanied by Israeli and international peace activists. 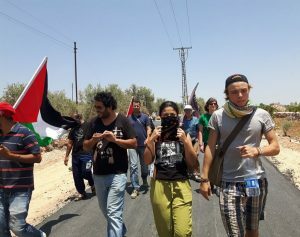 Approximately thirty Palestinians, and ten Israeli and international activists marched from the center of the village, heading towards Palestinian orchards, while the soldiers were deployed in some orchards, and in the mountain overlooking the village and its lands. 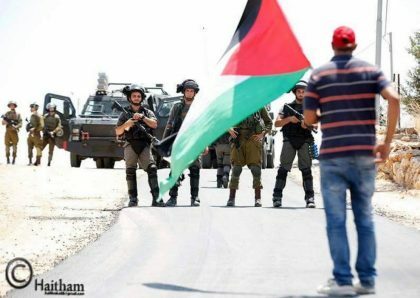 Ashraf Abu Rahma, a nonviolent solidarity activist and a cameraman from Bil’in, told the IMEMC that the villagers are demanding the removal of the illegal wall, and unrestricted access to their lands, their own orchards, isolated behind this wall. 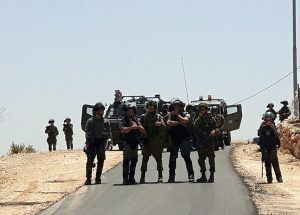 Although the soldiers were extensively deployed around the village, and in the Palestinians orchards, there has been no reports of army fire.